Power. Strength. Versatility. All in a single machine. SMALL ENOUGH TO SIT ON YOUR COUNTER. BIG ENOUGH TO POWER YOUR DREAMS. 1.3 HP* motor handles more than eight pounds of dough with ease. PowerCore® technology delivers consistent power with less heat buildup for long-lasting performance. Solid, stainless-steel, commercial-grade beater, dough hook and 11-wire whip come standard and are dishwasher safe. Models available with or without stainless-steel bowl guard. J-style handle for ease of stacking/hanging. Optional 5 and 7-quart bowls available for smaller jobs. *Motor horsepower for our mixer motors was measured using a dynamometer, a machine laboratories routinely use to measure the mechanical power of motors. 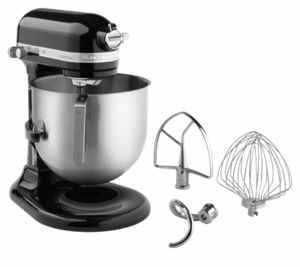 Our 1.3-horsepower (HP) motor reference reflects the horsepower rating of the motor itself and not the mixer’s horsepower output to the mixer bowl.